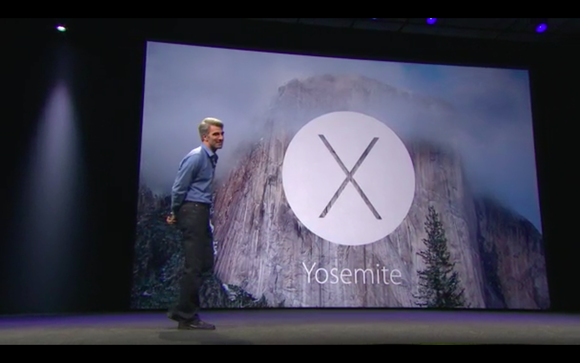 Apple on Monday announced that the next version of the Mac OS—dubbed OS X Yosemite, after the popular National Park in California—will be available as a free upgrade to the public this fall. Apple senior vice president of software engineering Craig Federighi takes the wraps off the latest version of OS X on Monday. Among Apple's own apps, Safari now sports a slimmer interface that leaves more room for content, and includes improved support for advanced Web technologies such as CSS and WebGL. Mail's improvements include the ability to annotate and even sign messages and attachments directly within the app, and sharing them with others. The company's services ecosystem will also experience several improvements when Yosemite hits the digital shelves: iCloud gains a new Drive feature, which offers access to file-based cloud storage à la Dropbox. A new feature, called Continuity, allows users to begin tasks on one device and continue them seamlessly on another, and is based on the same technology as AirDrop, which will finally work across both iOS and OS X. Speaking of iOS, the integration between Apple's mobile and desktop operating systems now extends to the ability to easily share cellular phone calls and SMS messaging, with support for both baked right into OS X, which will be able to make and receive calls seamlessly, so long as an iPhone is within reach and paired via Bluetooth. In a departure from tradition, the company will also institute a public beta program that will allow users to test the new operating system before its general availability, regardless of whether they are part of the company's developer program. Updated at 9:59 p.m. PT with a video report from IDG News Service.